Wonderful fun for puppies and their owners! 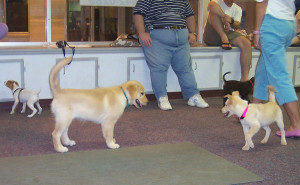 A novel off-leash class exclusively for young puppies 8 – 18 weeks of age. No force, no punishment, and no leashes! Creates safer, happier, and more confident puppies (as well as owners) through outstanding foundation training. Highly recommended prior to commencing formal obedience training at the Beginner Obedience level. 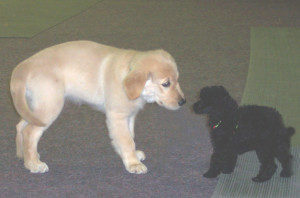 Skills Taught: Socialization with dogs and people, appropriate play behavior, bite inhibition, sensory stimulation, familiarity with enclosed places and strange surfaces, focused attention, and all-positive imprint obedience. $50 for 2 one-hour meetings.